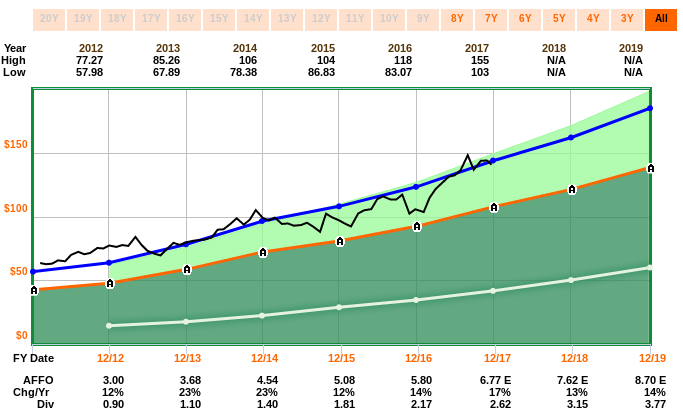 This for people that familiar with basic concepts of stock market investing but want a method to quickly analyze valuation and estimate return. This method will require use of computational tool. 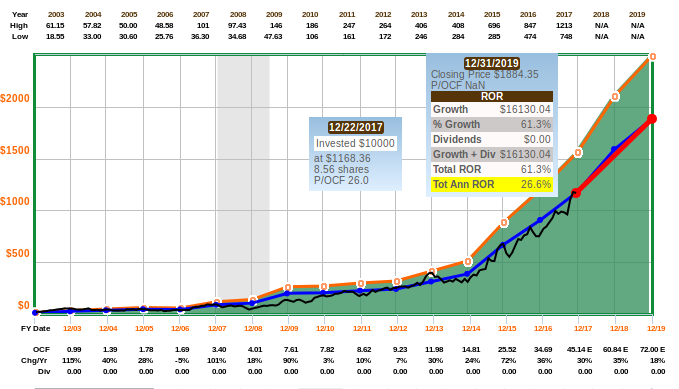 This will help you to value difficult stocks like Amazon with crazy PE value or simple dividend grow stocks like REITs. Demonstration is made with commercial software but there is no complex math involved so crafty persons can code them if they can access the data. 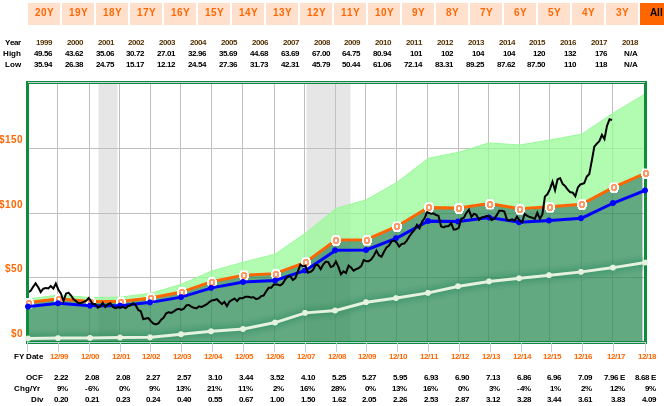 In very short form the method utilizes historical valuation to find intrinsic value and compares that to analyst estimates which can be used to estimate total return when mean reversion occurs. Don’t worry! I will explain what that all means in detail in following chapters. By no means I claim that following method is my invention but more like accumulated information from many sources but mainly from Chuck Carnevale from seeking alpha. Intrinsic value is a concept of value of stock that is something different from currently openly traded value. This is related to talk when people tell that stock is expensive of cheap as their own definition of intrinsic value is different from current stock price. So everybody can have their own intrinsic value for stock, hence the stock trading up or down. Instead of trying to 2nd guess how to best calculate stock valuation from quarterly statements and for example estimated future cash flow, I will show how to market can tell us from intrinsic value, and whether stock is trading up or below it. In the end it does not matter what ever I think of value of single stock as long as 90% of market does not think so and price gain never materializes. So we need to analyze how market values the company. And similarly to other factors if they are meaningful for the stock. However I think this type of curves are not useful in raw format like this. 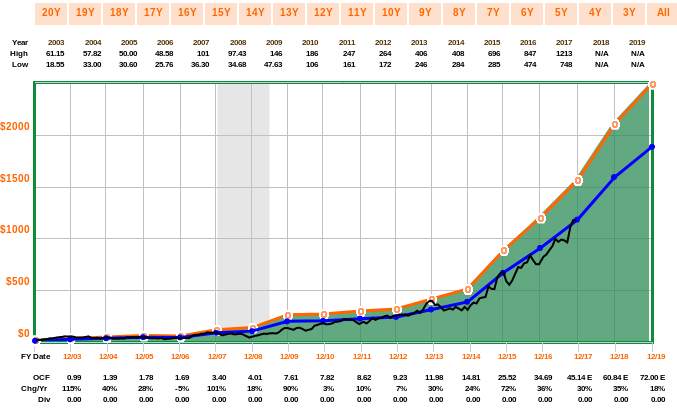 I want to use averaged(over a period like 10 years) valuation curve and multiply it with relative change in earnings. 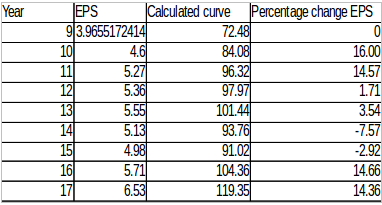 Calculated curve has starting point locked with average P/E ratio over the period. (18.2) The 2nd value is calculated by multiplying previous value with percentage change of EPS. Meaning that we assume that intrinsic value increases in fixed relation to change in earnings. And we get the yellow valuation curve like that. That curve is an intrinsic value candidate for the stock. Analyst estimates are estimates of company earnings for the next year or so. It is almost controversial nowadays to propose that they are any use in real world investing as media and sentiment is heavily tilted against active share picking with index funds. But I say that most just use them wrong. Like if an analyst says company earnings will be this and share price this in one year, I wont buy a stock just because that. I want to know what is track record of the analyst with the stock, how long they have followed the stock etc…. But there is a better way used with this method. Input not one analyst opinion but all of them into mix and value the estimate based on track record of all of them. 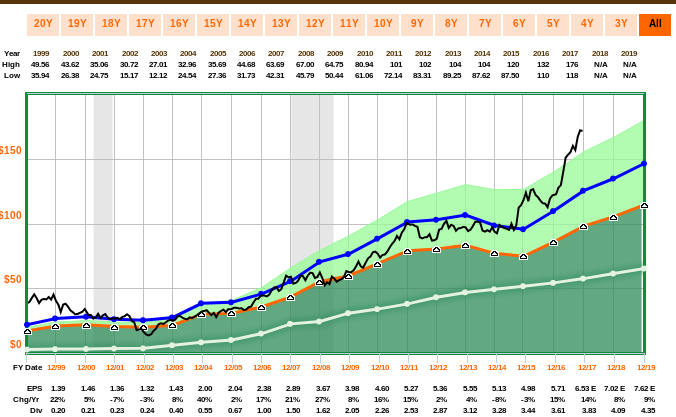 In sense, this method is a meta model as those analysts have their own models and methods for valuing the stock. Total return is simple to understand. It is dividend return and stock price change over inspection period. Taxes can be used also in calculation to make comparison between dividend paying and non-dividend paying stocks more realistic. American Tower Corporation is a communication tower operator and REIT. 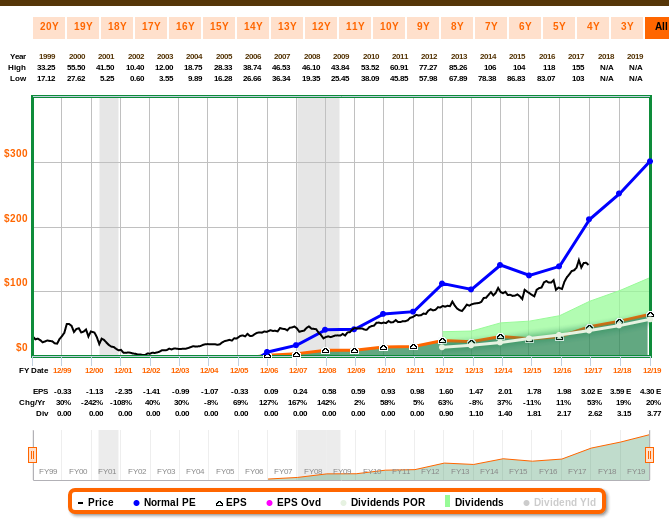 Black curve is the stock price performance and there is no clear relation between that and earnings. Following figure displays results with funds from operations P/FFO instead of earnings. 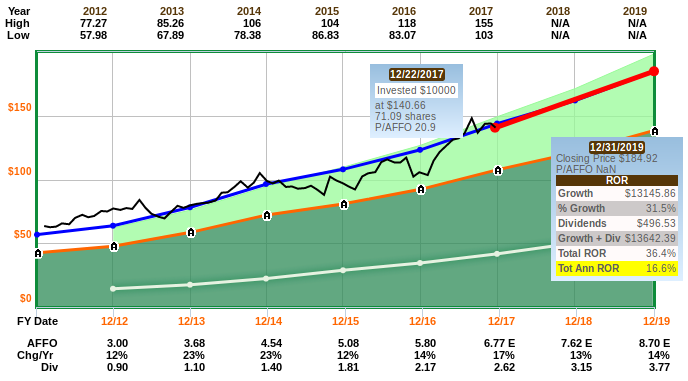 Average P/FFO for the company was 20.9 over the period which is used to draw the blue line. Analyst estimates are of course just estimates although aggregated values. Fastgraphs also provides data on how accurate the estimates have been in history. Estimates have been very accurate for this stock. This gives me good confidence on the total return estimate. Amazon is a company we all know and it’s stock performance has been stellar. 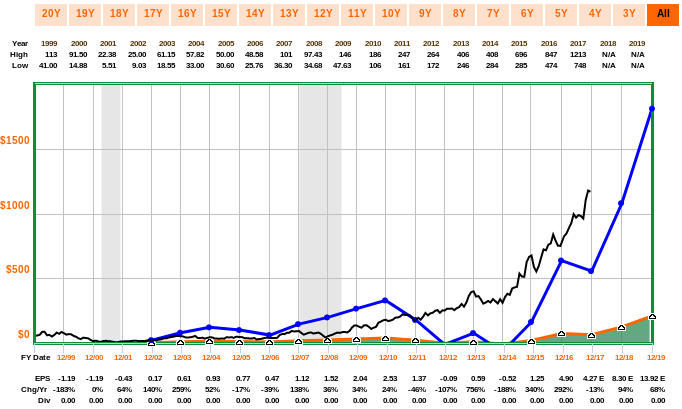 However company currently trades at price to earnings ratio of 272.6 which is pretty much nuts for most stocks. How on earth is market valuing the stock then? Price to earnings curve again does not correlate with stock performance very well. 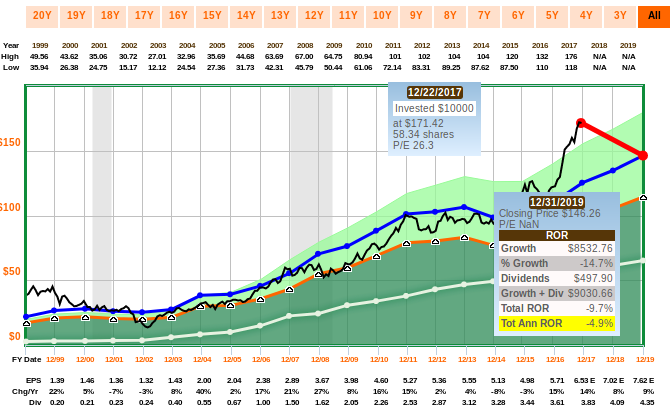 People are valuing the stock with cash flow performance as company is investing still heavily to growth. Here is price to operative cash flow graph done similarly. Now we have again found the intrinsic value for the stock that is respected by the market. Total return estimate gives us 26.6%. Amazon has been beating the estimates most of the time so nothing alarming. But of course market can start demand earnings also from AMZN at some point. 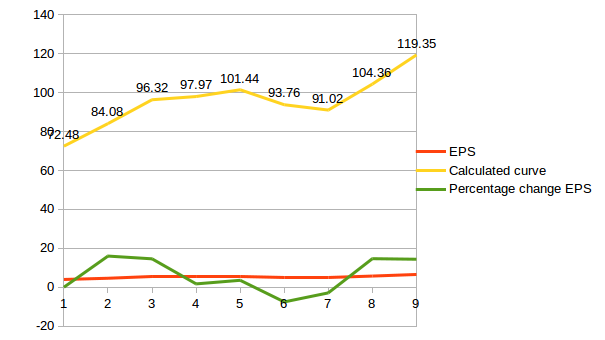 Until 2015, stock price follows the EPS curve but then something happens. Some might say that this has nothing to do with technical analysis but I see this method combining both for more sound investment decisions. I like Fast Graphs for this analysis method. However there are other alternative also like oldschool value. I currently have basic version of the software but I might buy the whole deal next time to access to the screener also. Business development companies and such high yielders are harder to evaluate with the method but dividend curves are best match how value them as high yielders pay most out anyway.